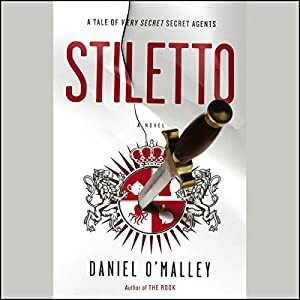 Stiletto is the sequel to the fantastic book The Rook, by Daniel O’Malley, and the review contains spoilers for the first book. In Stiletto, Myfanwy Thomas’ truce with their enemies the Grafters is beginning to solidify, but the anger and fear on both sides is difficult to dispel. However, they soon realize they have a mutual enemy to fight. Instead of focusing on Myfanwy Thomas, as The Rook does, Stiletto jumps between several main characters. In fact, Myfanwy is rather a minor character in this second book. Despite my interest in the other characters, I was missing Myfanwy’s unique perspective on things. Instead of explaining the Checquy through the eyes of an amnesiac learning the ropes, this book went off on rather dull divergences about the history of the Checquy and the Grafters. This made the book rather longer than it ought to have been. That’s added to minor subplots and incidents which could easily have been left out of the book. I don’t mean to say that I didn’t enjoy Stiletto, only that I enjoyed it a lot less than The Rook, and feel that it would have been a better novel if shorter.